Ideologies evolve. In a documentary aired a few months ago, a North Carolina conservative spokesman dismissed the participants in Moral Mondays by claiming comparisons with the civil rights movement were laughable. More sincerely and without revealing any sense of irony, he questioned “those who equate it with the 60s and 50s and some of the great struggles in history,” movements that were opposed by conservatives at the time. To an Independent like me, it seems ideologies on the right or left tend to make progress in a circular, two steps forward and one step back but usually moving forward. Two books that I read in 1991 and 1992, shortly after moving to Durham, seem even more relevant today. One was entitled The United States of Ambition: Politicians, Power, and the Pursuit of Office by journalist Alan Ehrenhalt. It traced a number of localities as case studies where a relatively few members of an ideology - both on the right and left – were out of step with the general local electorate at the time, but still able to assume power and execute change. His latest book, The Great Inversion and the Future of the American City, is a particularly good read in light of recent efforts in the North General Assembly to override this progress, including a new effort this week by a powerful state senator to strip away tree ordinances. 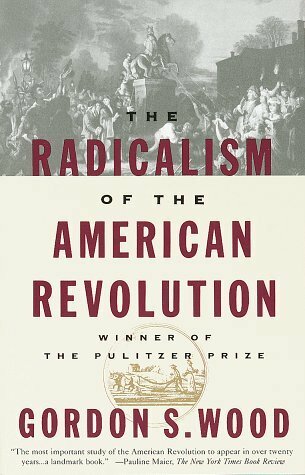 The other book I read in the early 1990s is entitled, The Radicalism of the American Revolution, by Dr. Gordon S. Brown. Packed with citations and statistics, the book makes the argument that what we view as the American Revolution in the narrow sense was really the culmination of more than two decades of social and cultural disruption here. In fact, the war was in opposition to a conservative effort to turn back those changes. Following Independence, the founders made a concerted effort to evolve a new, more modern set of social and cultural adhesives to hold the new society together. Conservative resistance to social and cultural change may go back at least to two thousand BC and the requirement for people to have last names, something more broadly but gradually implemented in the English-speaking world after the Norman invasion of William The Conqueror. But this was nothing like the reaction to the wholesale changes in the American colonies leading up to the Revolution. There was a breakdown in vertical social strata among classes. Wealth was no longer viewed as trickle down. Land ownership and working for a living became the standard across classes along with rampant land speculation. The patriarchal family devolved including introduction of divorce laws and inheritance changes. Hundreds of evangelical religions surfaced. People began to run for office regardless of their station in life and voting increased. Entrepreneurism took hold and people began to produce surplus for trade rather than subsistence. Contracts replaced handshakes. Gone was the notion held by social conservatives that “only poverty and starvation would induce common people to work.” Hierarchal structure was eaten away or transformed by classical style republicanism which became used as a pejorative much as the label “liberal” has been made today. In general, there was a radical, two-decade long, counter-cultural desacralization in America that makes the 1960s seem very tame by comparison. Conservatives responded back then by desperately trying to make it hard to move, harder to vote and run for office and advocating a general return to cultural norms. This was the period from around 1750 until 1775, a time of great anxiety and change like none other witnessed before or since in such a concentrated span. As a society we seem to work best when those reluctant about change serve as a soft brake on the pace of change rather than a dogmatic regression. The genius of the American Revolution set the stage for eventual emancipation and the full extension of equal rights. The founders did not limit their development of social and cultural adhesives to just government institutions. They set about through promotion of a liberal arts education to socially re-engineer America, including using utensils to eat, brushing your teeth and not talking loudly in public to name a few. By the second decade of the 1800s, Americans were “already referring to themselves as a society dominated by the ‘middling” sort’, a term for the middle class. But the founders were never able to resolve an issue that raised its head almost immediately and still plagues democracy today. They were unable to protect government for the common good from self-interests which has become overwhelming since the bicentennial of the Revolution in the mid-1970s. Those who profiteered during the Revolutionary War pushed to see that continued, overwhelming the wishes by the founders to focus government on the collective, common good. As an Independent, I just want to rid government of self-interests. Period.